First American Equipment Finance is a wholly owned subsidiary of City National Bank, a highly-respected business bank with a long track record of strength and stability. As a client, you receive a dedicated, entertainment-focused Project Manager who knows your company and your project, and takes personal ownership in driving growth and success for your organization. "Very competitive, friendly, and professional service. I will do business again with First American." See why media + entertainment companies across the country choose to work with us. 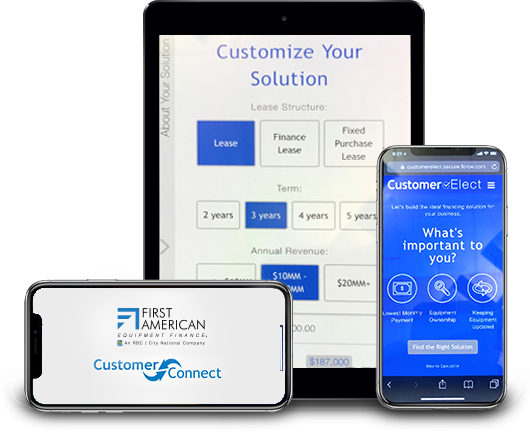 When you work with First American, you are working with a direct lender, not a broker. We are a wholly owned subsidiary of City National Bank, a highly-respected business bank a long track record of strength and stability. Need a custom solution for your unique needs? Your media + entertainment finance specialist will collaborate with you to create an on-target solution to help you revolutionize your business. At First American, we commit to doing whatever it takes to earn your loyalty. While other lenders may come and go, we have never wavered in our commitment to serving the unique equipment financing needs of the media + entertainment industry. In this industry, constant equipment upgrades are non-negotiable. But what happens to your old equipment at the end of your lease? First American can sell it and put 100% of the proceeds towards your new equipment.